Atlanta's Magic House Presenting EL Drusso and his friends "The ultimate experience in entertainment". We love what we do and it shows in our work that's why Your satisfaction is 100% guaranty!!! The Magic House provide Close-up magic, Cabaret/stage magic, Grand Illusion magic, Mentalist magic, Strolling magic, face painting, balloon twisting, and much more. Add Face painting to your event People of all ages can enjoy the experience of having their faces transformed into an exciting mask or accented by adorable cheek art. Our face painting strives to maintain the highest level of artistry with our skills & designs. Using only the best quality products, FDA approved hypoallergenic paints. The El Drusso's Magic Show For Kids and adults: Dru Lozano (El Drusso), Magician, Illusionist and comedian, Winner of the international stage comedy magic and Illusion competition held in South America Venezuela is actually The stage and artist director of the Magic house, he has been put together his 15 years of experience in entertainment for Festivals, Corporate events, Grand Openings, Store Promotions, Restaurants, Sporting Events, Company picnics, Private Parties, TV & Radio events, and much more to created the most fun and exited family friendly show to everybody kids and adults can enjoy. That makes us the perfect option for your next event!!! In His Interactive Magic Show he can bring the assistant, the white magician doves the magic rabbit (the animals are real and trained you will have a picture time) and face painting artist, to give you a really high energy show and of course that will feature the Birthday Child as the Special GUEST Assistant to the Magician. His amazing entertaining style of delivery will be remembered by your guests for a long time to come. The El Drusso's Grand Illusion Show "Las Vegas in Atlanta": The big show comes to you! 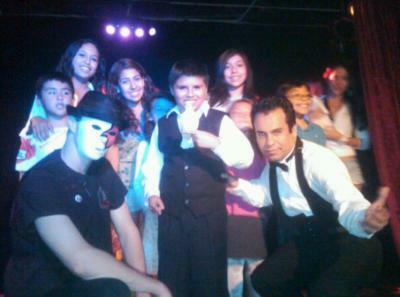 We bring to you a stage illusion show Music, Magicians Assistants, and the big illusions. If you want a high energy roller coaster ride of a show, and you want it to come to you, this is the way to go. You won't find this anywhere in Atlanta. This is a stage show recommended for big celebrations, private event, or corporate event. Our goal is to provide the best experience for you and your guests, but, specially, we want each one of you to have a special and magical moment in your own way. Please check out our website for Galleries full of photos and many combo packages available! Call us today for your next event!!! Who are we? In the world of family parties and corporate events there is only one magic show that consistently succeeds at bringing excitement to people's lives. We do everything we can to make every event magically unforgettable. We are one of the most engaging and exciting shows to date. What makes our show different you ask? We collaborate with not just other magicians but other professional comedians, illusionists, Hypnotist Magician, jugglers, face painters, balloon designers and professional theater directors. With our diverse team we are able to quickly adapt our show to fit your preferences. Where have we gone so far with this? We have done magic for many different companies and captivate people across the world. South America, Central America and the United States are just some of places around the world that our entertainers have spread our gift of magic too. Our neighborhood Halloween party was extra special and entertaining because of our hiring of Atlanta's Magic House. We hired a strolling magician and two face painters. The guests enjoyed flipping through the many great face paint designs and the finished artwork was superb. They arrived early and entertained the set up crew and painted their faces which was a great perk for our volunteers! We were very impressed with the way they exceeded our expectations and added so much entertainment value for a very reasonable price! I'm not really a big fan of reviews, but I would strongly like to recommend this company. This party was great, it had a lot of great entertainment and also a lot of organization. I also loved how the magicians interacted with all the children and the parents in the show. The children loved it and so did I. Because of this great experience in magic, of course I have a good satisfaction. I really thank El Drusso team for making this unforgettable party. Please note Atlanta's Magic House Entertainment Company will also travel to Rutledge, Newborn, Madison, Social Circle, Mansfield, Jersey, Good Hope, Shady Dale, Buckhead, Covington, Porterdale, Bishop, High Shoals, Monroe, Oxford, Bostwick, Monticello, Farmington, Athens, Conyers, Eatonton, Loganville, Watkinsville, Greensboro, Norcross, Bogart, Bethlehem, Smyrna, Statham, Hillsboro.